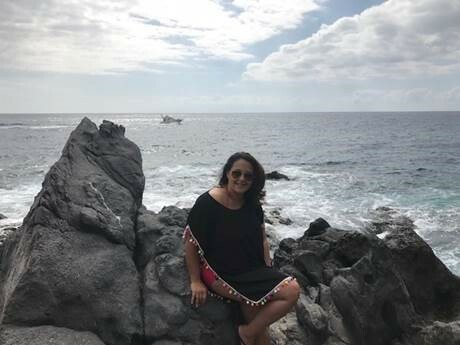 Our close friend and preferred partner, Stacey Colonna, who represents Marriott International Luxury Brands, recently returned from a visit to Spain, where she had the pleasure of staying at The Ritz-Carlton, Abama. There are connecting flights at very convenient times from NY-JFK and from anywhere else in the USA. We flew from JFK to Madrid with a brief 2-hour layover giving us just enough time to head over to the connecting gate with a few stops at the shops along the way. Tenerife was our final and only destination this trip, but you can certainly create a very exciting itinerary with a stay in vibrant city like Madrid or Barcelona during your connection before landing in Tenerife to start your awe-inspiring beach vacation. The natural beauty in Tenerife is spectacular - all elements are represented and in their maximum glory. For a nature nut like me, it was the most delightful experience. The night sky is unpolluted with light so the goodies above are to be seen to be believed. I saw more stars in the sky than I have ever seen in my lifetime! The Ritz-Carlton, Abama’s neighborhood sky includes our planet’s view from within the mighty Milky Way which sits directly above the resort and can be seen with the naked eye (WOW!) The hotel knows their view is pretty special and they offer guests a private, casual, beach stargazing picnic that comes complete with a highly educated and enthusiastic astronomer and a 2-Michelin Star picnic catered by M.B. restaurant. Reservations required. We had the pleasure of enjoying this picnic, and I highly recommend it for your guests for a memorable and educational experience they will never forget. In Southern Tenerife where The Ritz-Carlton is, you are guaranteed perfect beach weather and low humidity 98% of the time throughout the year. 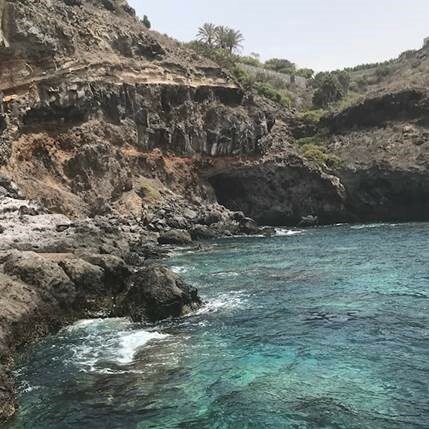 Picture an ocean that looks like a kaleidoscope of aqua, turquoise, cerulean, royal and navy blue and you have the gorgeous waters of Tenerife! Being a volcanic island, the Canary Island’s waters are rich in healing and therapeutic minerals. The Ritz-Carlton is situated on a cliff and the landscape is made up of volcanic nooks and crannies of smaller cliffs and caves galore. Climb to the top of a small cliff located on at the resort’s beach and dive right into the ocean if you dare (it’s totally safe - and yes, I did it!). Swim in any one of the natural pools that nature created inside the crevices of the land on the cliffs was one of the most memorable beach experiences of my lifetime. The resort beach is very intimate but public which is nice because you get a little local flavor. The facilities, Beach Club, lounge chairs and services are reserved for hotel guests though, so guests still have exclusivity. The beach itself if small enough to attract only an elite crowd and the experience feels extremely private and secluded. The stars in the sky are not the only impressive ones in Tenerife, and The Ritz-Carlton, Abama has two Michelin Star restaurants: Kabuki (1 Star) and M.B. (2 Stars). There are 8 additional restaurants offering everything from tapas to Italian, sure to please every diner’s culinary wishes. 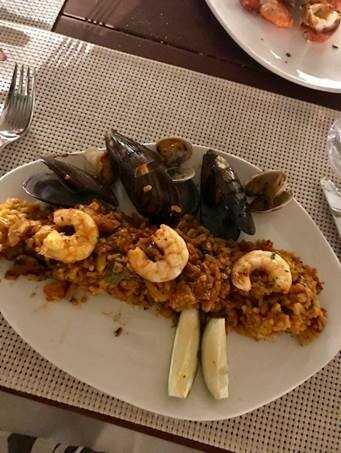 My personal favorite dishes were seafood paella at El Mirador and ceviche at Txoko. The main building has 313 rooms & suites, a Ritz-Carlton Club level and Club Lounge. This section of the hotel caters to families with 8 family suites and 3 specialty suites; Imperial Suite, Royal Suite and The Ritz-Carlton Suite each with the very best views to the ocean and of the spectacular grounds at the resort. My favorite accommodations are located in the 4 Villa rows on the property grounds. The units themselves are large guestrooms and suites however the row and the exclusive pool and services you enjoy are all what makes the secluded area on the resort grounds Villa-like. We stayed in the Tagor Villas; the adults only villa row that comes complete with a personal buggy for use while in residence. Nice touch! These villa rows feel like a resort inside the resort, and for those who want more exclusivity than what they would have in the main building, this is the perfect option. Just in time for holiday season, debuting this October are four brand new Villa Deluxe connecting rooms and One-Bedroom Villa Family Suites (for families of 4). The Villa Family Suites feature vast walkthrough living spaces with generous sitting rooms and dining areas, king-sized master bedrooms and balconies overlooking the resort’s lush botanical gardens and swimming pool. Always fun, and this hotel does it “Pirate-style” with a fun treasure hunt. You must inquire directly as the treasure hunt is a seasonal, limited option for kids at the resort however the Kids Club is open all year round with indoor/outdoor facilities to keep the little ones busy. Day 1: arrive and relax at the resort. Have lunch and spend the day at the pool (there are 7 pools on the resort grounds) or at the beach. Rest up then have dinner at one of the 10 restaurants at the resort. Day 2: enjoy a day at the Spa. The facilities will keep you busy the entire day and this Spa is truly a highlight at the resort -- not to be missed. Enjoy dinner at one of the 10 restaurants at the resort or head into Playa de San Juan for a local and very casual dinner (just a 5-minute cab ride from the resort). Day 3: spend the day to late night up north. The Ritz-Carlton is South on the island where the weather and beach take center stage and just an hour to the North is where the island “attractions” are. I recommend reserving a private car and driver for the day and start your adventure driving through Vilaflor one of the local villages, then through the magnificent pine forest and into the plateau of the Teide the spectacular Volcano, with its moon-like landscape where films like Planet of the Apes, and Clash of the Titans have been filmed. You literally feel like you are on another planet! Then walk through the fabulous Orotava Valley to Icod Los Vinos, known for its wines and the famous Drago tree known for its mystical powers. Have a typical Canarian style lunch at the restaurant of your choice then move on to Garachico a local town destroyed in the volcanic eruption of 1706. End your day tour with the magical village of Masca with its amazing views of La Gomera which has approximately 120 inhabitants. Take advantage of your time up North and join a Stargazing group tour at sunset at Teide National Park for a view of the night sky as you’ve never seen it before! Day 5: spend your morning out on the water for dolphins and whale watching- available to view all year round! Come back to the resort in the afternoon to relax and enjoy the resort’s facilities; beach, spa, pool, and restaurants or depart for your city excursion if you plan to connect via Madrid or Barcelona.